Led strip or LED tape lights, LED ribbon lights and LED rope lights – can be used for under- and over-cabinet lighting as well as to illuminate the countertops and cabinet toe-kicks and more. Some of the strips come with an adhesive backing for peel-and-stick installation as well as DC connectors so they are plug and play. This type of LED lighting is not only easy to install, it is extremely energy-efficient and versatile. It is particularly popular in kitchens and bathrooms, where task lighting in multiple areas is needed. Choose from a single colour or go with RGB changing colour strips that you can dial up a colour. This is a 24v strip light. If you need the 12v version please see my other listings. Great .. These are a plug and play strip light as they come with a free DC connector already installed. No so..
Works with our RGB strip lights and is fully plug and play. 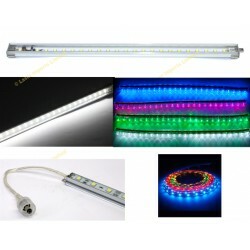 Comes with 44 key remote ..
6W 50cm Waterproof led strip lightFully waterproof silicone filled strip light.It has ..
You are buying 1x Plug and Play Changing colour RGB led strip light and connectors. Plug and .. These are a plug and play strip light as they come with a free DC connector, just push the wire in t..
You are buying 1x Plug and Play single colour strip lights Features 2x 50cm strips wit..
Mini Strip light dimmer for the 8mm and 10mm strip lights. 12v only.Connect one end to the pow..
Works with our RGB strip lights and is fully plug and play. This changes the colour and fla..
You are buying one RGB led strip light kit with controller and power supply. Fully plug and p..
You are buying one Waterproof RGB led strip light kit with controller and power supply. Fully..
You are buying a WIFI remote and interface for our changing colour strip lights for our wifilights ..